This print is very rare. Enlarge this print and look closely at the woman's reddish-brown robe. The lighter colored design pattern is made up of a horde of hares.Her hairpin has a carved fish on it. The reticulated comb in her hair is a pierced floral pattern. That same motif of the squat hare facing the viewer straight on appears at least two other times in Lyon Collection. Both of the other examples are by Koryūsai and date from approximately fifty years earlier. They show up on the as a single hare on the back of an outfit worn by a young boy: #s 1320 and 1352. 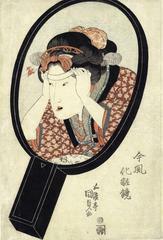 Illustrated in color, 1/4 page, inUtagawa Kunisada: Bijin-ga wo Chushin ni (歌川国貞 : 美人画を中心に), Seikadō Bunko Library, 1996, p. 52, #72. The Seikadō Bunko Art Museum (静嘉堂文庫) owns a copy of this print along with the others in its set.